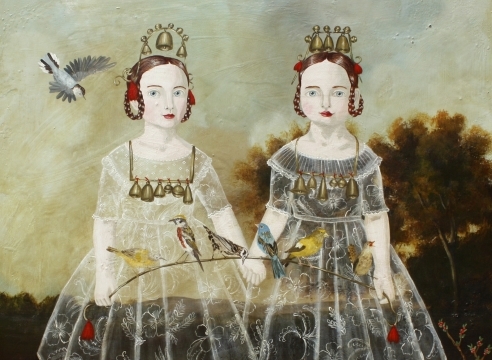 We are pleased to present the paintings of Seattle based artist, Anne Siems. In this exhibition entitled, Tableau, she places the figure within more defined landscapes than before. Much like a cabinet of curiosity, a display of elements is placed upon a table: toys, flora, fauna, and foodstuff, miniature figures in costume, and items of clothing. Without her being too specific, Siems’ dream-like depictions allude to childhood memories, wonderment and 19th century ideas in scientific study and psychoanalysis. Imagery of eyes and mouths hanging from strings evoke a thoughtfulness and emphasis on the senses, while her lone figures look out at the viewer as if on stage. Siems delves intuitively to find a mystical open-ended narrative. “The final image emerges in a process that is uninterrupted by analysis and is moved by free association from a visceral place.” Her works are lilting and compelling in their dreamy timelessness. Born in Germany, Anne Siems received her MFA in 1991 from Hochschule der Kunste in Berlin. She has exhibited in the United States since the mid-1980s, at galleries in Chicago, New York, Los Angeles, and San Francisco. She recently completed a commission for Nordstrom’s, Denver, CO. Her work is in various public collections including the Arkansas Art Center, Little Rock; Boise Art Museum, ID; Microsoft Collection, Redmond, WA; Tacoma Art Museum, WA; and University Hospital, University of Washington, Seattle.